Filling and delicious, this chicken omelette is more like a lunch than a breakfast! It's full of shredded chicken, nutty gruyere cheese, and chopped spinach. All the food groups when you serve it alongside crusty bread and a little side salad with a light vinegary dressing. 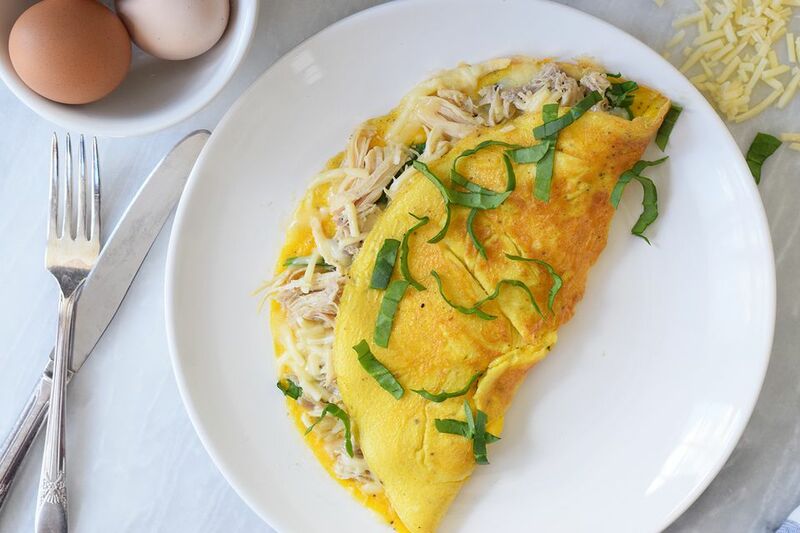 This omelette is super easy to whip together, especially if you have leftover rotisserie chicken, but it tastes like it took all day and looks super impressive. Whisk the eggs until the yolks and whites are completely combined. Add salt and pepper. You can add more to taste later. Heat the teaspoon of oil in a non-stick or cast iron skillet on high. Swirl the oil around so that it completely coats the bottom of the pan. Pour the beaten eggs into the skillet and turn the heat down to low. Swirl the eggs to completely coat the bottom of the pan. Using a rubber spatula pull the egg from the outside edge into the center, exposing parts of the pan so the egg can cook completely. Then leave the omelette alone for another minute or two. Remember to cook it on low heat so that it does not brown too much. Warm the chicken slightly in the microwave or on the stovetop before adding it to the omelette—it won't get hot enough to completely heat up all of the chicken. Add the shredded chicken, shredded gruyere, and chopped spinach to half of the omelet. Cook for 30 seconds. Fold the other half of the omelet over the top of the filling. cook for another 30 seconds to a minute or until the cheese has melted. Serve with a small spinach salad and some crusty bread! We used a nice gruyere cheese but you could really use any cheese you have on hand. Feel free to add some finely chopped herbs like chives and parsley. You can also mix it up by adding in a little cream cheese to the rotisserie chicken for a little extra indulgence. Use a rotisserie chicken or make your own shredded chicken. You can make it in the Instant Pot, the slow cooker, or just grill or boil the chicken. Then simply shred it with a couple of forks. Refrigerate or freeze what you aren't going to use for the omelet. It's a great addition to salads, soups, and casseroles. Do not add any ingredients to the eggs except bits of chopped up butter! Milk will make the omelet watery and thin. Can You Use Frozen Chicken Eggs?